4PA’s ArchiMate 3 Bridging course is a self-paced, intuitive and engaging course that allows both individuals and teams to build on their existing knowledge of ArchiMate 2.1 and gain an understanding of the specification changes that ArchiMate 3 delivers. The course offers 6 months of access, allowing the candidate to design their own study schedule. Also included is a free exam voucher. This course is based on the ArchiMate 3 Practitioner syllabus with a focus on outlining the improvements from the 2.1 standard. ArchiMate terms are explained in detail for your benefit and are supported with examples. Completing this course leads to a thorough knowledge of the terminology, structure and concepts of the ArchiMate 3 Specification, and places the candidate in a position to succeed at the ArchiMate 3 Bridging exam (included with the course). Why Study ArchiMate Bridging With 4PA? This course comprehensively covers the improvements made in the ArchiMate® 3 modeling language and how it can be practically applied when creating enterprise architecture models. Students who have taken this course will have met all of the learning requirements required for ArchiMate 3 Certification. In this module we take a look at the ArchiMate Standard’s design considerations and to-level language structure before moving on to the layers and framework. We will also cover studies of abstraction, concepts and notations, nesting, use of color and notation cues. This module reintroduces the ArchiMate Metamodel and identifies the improvements made in relation to version 2.1. The module is completed by going on to define the core set of relationships and their classifications as defined in ArchiMate 3. In Module Four, “Motivation and Strategy Modeling”, we begin by looking at the motivation elements, which are used to model the motivations, or reasons, that guide the design or change of Enterprise Architecture. This module will then look at existing elements before highlighting new elements, including value and meaning, formerly of the Business Layer, and outcome. We will then turn our attention to the strategy elements, namely resource, capability and course action, and explore their relationship with the core and motivation elements. 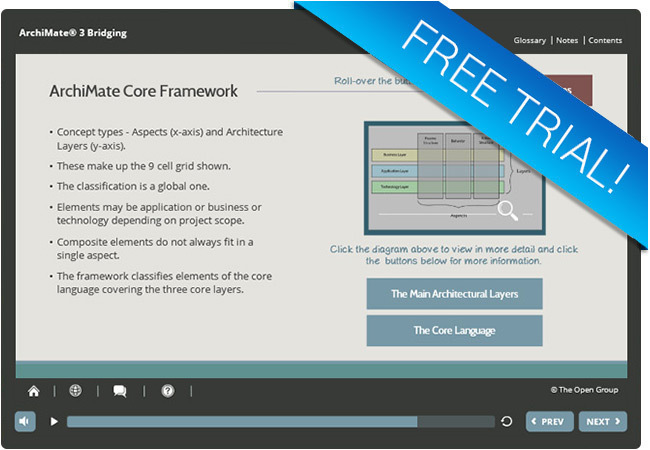 In this module we will explore the elements that make up the three layers in the ArchiMate framework. The purpose of this module is to highlight the new and changed elements in the business, application and technology layers in ArchiMate 3, and to help you gain a better understanding of how entities within each layer can be used in practice modeling situations. A central issue in Enterprise Architecture is the alignment of business and IT. This module describes the relationships that the ArchiMate language offers to model the link between business, applications, and technology, and serves to explain the cross-later serving and realization relationships. In this module we will investigate the Implementation and Migration elements and modeling as defined in the new release of the standard. We will then go on to explain the viewpoint mechanism concepts and structure in the ArchiMate 3 standard. The final module is devoted to the customization mechanisms in the ArchiMate 3 standard. We will look at how language can support more specific purposes without burdening it with additional material. When you have completed the ArchiMate 3 Bridging eLearning course, you should start your preparations for the exam, which is available to take through Pearson Vue, at a testing center in your region. Certification in the ArchiMate Bridging course requires you to pass two sections. The first section is a multiple choice exam consisting of 20 questions. The second section consists of four complex scenario questions, with gradient scoring. After passing the exam you will upgrade to a certified ArchiMate 3 Practitioner! Pearson Vue are the authorized providers of exams for TOGAF, IT4IT and ArchiMate certification, and host exams worldwide through a network of test centers. The pass-rate for the exam is 65%: you must get 26 out of 40 questions correct (Section 1: 20 questions, Section 2: 4 questions). The time limit is 75 minutes (Section 1: 30 minutes, Section 2: 45 minutes).  The exam is open book – an electronic copy of the ArchiMate 3 Specification is built into section 2 of the exam. No hardcopy books may be used at test centers. When you have completed the course, contact 4PA support and request your free combined (level 1 & 2) exam voucher which can be used at any Pearson Vue test center. Please note that your voucher must be ordered within 12 months of you course access and if you require 2 separate exam vouchers, this will come at an additional cost. Contact a member of our team to find out more. Why not try out a free trial module from our ArchiMate 3 Bridging eLearning course! In this free trial module, you will learn about the improvements made to the Metamodel in relation to version 2.1 via a mixture of interactive and audio techniques to enhance the learning experience. Like the full ArchiMate 3 Bridging eLearning course, you can access this free trial module from any device whether you are at home, at work, or on the move!